Aspire Nautilus Atomizer BVC Coils are replacement heads for the market-leading Aspire Mini Nautilus and Original Nautilus devices. The innovative vertical BVC (Bottom Vertical Coil) has been expertly designed to ensure the atomizer heads last longer than other Aspire coils. 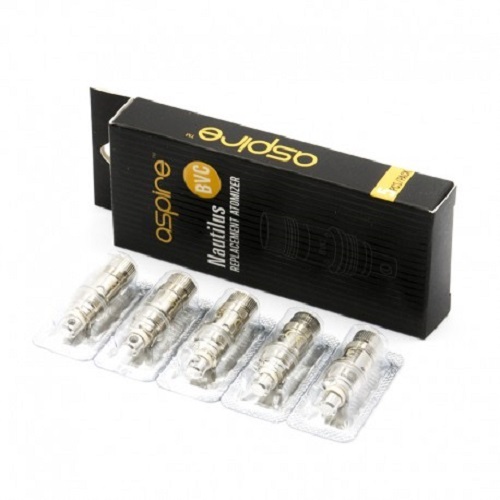 The replacement pack comes complete with five dual coil heads, which are available at 1.5 Ohm and 1.8 Ohm. The first two coils out of the packet, failed in less than 24 hours. The third one is still working 48 hours after putting in. Not impressed that so far at least two of the five haven't worked properly. Having since done a little research it would appear I'm not the only one to have this problem. Hi Sarah. After you filled the tank did you make sure you left it for about 5 minutes before using? Also was was the eliquid being used?